When you need a little extra space for passengers and luggage, while maintaining a powerful engine, a full-size car rental is tough to beat. Affordable Rent-A-Car And Sales was built around the notion that customer service is priority number one, and we haven’t strayed from that belief since opening in 2000. In fact, when you rent a car from us, you’re guaranteed our attentive agents and representatives will assist you with any of your rental needs. Pick up the phone and call our office in Salt Lake City, Utah at (801) 266-7368, or submit an online reservation to rent a car, van, SUV, or any of our other vehicles on your next trip. Both families and businessmen and women will find a full-size rental car to have the space they need and want. With a comfortable amount of seating for up to five passengers and trunk space for carry-ons and luggage, a full-size car is certainly more inviting than a cheap car rental. With the added style of a luxury car rental, a vehicle of this size is especially suitable for those needing a temporary insurance replacement car in Salt Lake City. 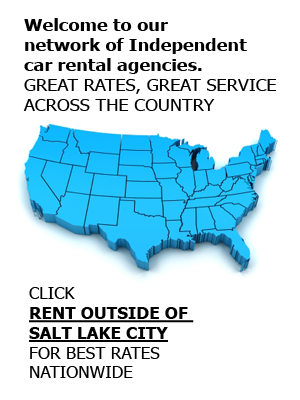 Rent a Car in Salt Lake City Today! We are privileged to offer conveniences to our customers when they rent cars from either of our two locations (both in Salt Lake City). Such conveniences include free delivery, pickup, and drop-off services for airport rental cars, a door-to-door shuttle for renters throughout the SLC valley, and always affordable rates on every car rental and vehicle in our fleet. We also venture to say we have some of the most helpful rental agents in the area, all of whom make it their objective to assist you. At www.affordablerentacarandsales.com, we have a comprehensive assortment of rental vehicles, including standard car rentals, midsize cars, and pickup trucks. We also rent to production companies and offer used car sales. If you’d like a free quote, or would like to reserve a vehicle, call us at (801) 266-7368 today.